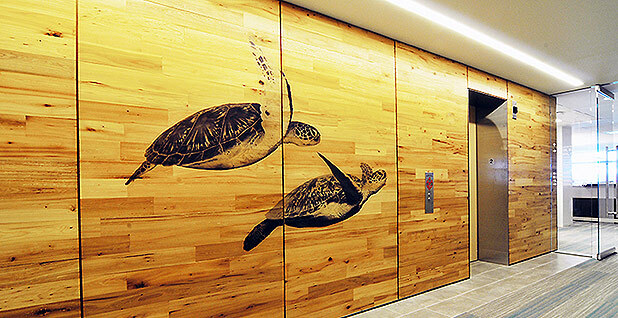 Laser-printed images of sea turtles adorn office walls at the Fish and Wildlife Service headquarters in Falls Church, Va. Gilbane Building Co. The Fish and Wildlife Service faces a $1.3 billion deferred maintenance backlog that can sometimes get overlooked despite its ominous size. Wildlife refuge boardwalks are warping. Observation decks are rotting. Toilets are leaking, roads are cracking and roof tiles are breaking. And, officials fear, the put-off problems will only get worse unless something changes. "Some of these areas get to a point where we just have to shut them off for public use, because of public safety," Greg Sheehan, principal deputy director of the Fish and Wildlife Service, said in an interview. "Some are closed for seismic standards. Many others [are closed] because restrooms, boardwalks, visitors centers just aren't usable or safe." A political appointee who formerly served as director of the Utah Division of Wildlife Resources, Sheehan is part of the Trump team that inherited a deferred maintenance challenge that's vexed administrations of both parties for many years. With some 5,000 buildings and 6,938 other structures to tend across 566 wildlife refuges, among other responsibilities, FWS has to struggle to keep up with problems that the public may not see. "It's sort of like your house," said Cynthia Martinez, chief of the national wildlife refuge system since 2015. "You want to make sure the sidewalk looks good so that when people are walking up to the front door it looks good, [but] they may not necessarily know that you've got major issue with your pipes." Sheehan cited a visit he made to the National Elk Refuge in Wyoming, where he said all seemed to be in tip-top shape, until refuge officials brought him out back and showed him some dilapidated footings. Nor is it just the 51 million annual visitors to FWS lands who may overlook the agency's decidedly unsexy deferred maintenance needs. When lawmakers and Interior Department officials invoke their favorite cliche about maintenance, they're often focusing on another Interior agency. "The problem of today is simply that the parks are being loved to death," then-National Park Service Director Conrad Wirth reported on Jan. 27, 1956. "Sometimes I've said that our major national parks are being loved to death," Sen. Tom Udall (D-N.M.) said in 2010. "This coming year, we are going to rebuild Interior, because our parks are being loved to death," Interior Secretary Ryan Zinke said at an early February department town hall, before adding that "our refuges are being challenged" (E&E News PM, Feb. 1). Getting the Interior secretary to include refuges in the litany of priorities was a small victory for FWS officials, who recognize the Park Service's estimated $11 billion deferred maintenance backlog is far larger than their own. With the new catchphrase "Important Places for Important Faces," FWS officials have also prepared a video and other material calling attention to the deferred maintenance needs. A newly scheduled hearing before the House Natural Resources Federal Lands Subcommittee next Tuesday will further focus attention on Interior's overall maintenance backlog. More than shoutouts, though, it's money that provides a concrete solution, and that poses its own kind of challenge. Interior's proposed fiscal 2019 budget offers $41 million for FWS deferred maintenance, a $295,000 cut from current levels. The agency said the funding would "allow the Service to complete about 128 of the highest priority" projects. The department's proposed budget also calls for a $2.9 million reduction in spending on deferred maintenance at FWS's fish hatcheries. "Right now we're operating under a very conservative budget that the president has outlined for us," Sheehan acknowledged, adding that the deferred maintenance cuts were relatively small compared to those in some other Interior operations (Greenwire, Feb. 2). As part of making do in the modern budget environment, the agency has started taking steps like consolidating maintenance equipment and personnel in centers that serve multiple refuges. "We're a duct tape and baling wire kind of outfit," Martinez said. More ambitiously, Zinke has proposed in broad terms a "public lands infrastructure fund" that would collect revenues from increased energy development on federal lands and deploy the money toward the deferred maintenance backlog. Zinke has spoken of the plan as potentially providing up to $18 billion over 10 years. "We're kind of trudging along, trying to keep up with the worst of the worst," Sheehan said, adding that the new plan "would get us down the field playing offense, instead of playing defense all the time." So far, though, important details about the proposed infrastructure fund remain unclear, including questions about whether Congress would play a role each year in appropriating the dollars. The $18 billion figure itself relies on certain assumptions (E&E Daily, Feb. 12). Still, officials say, the need is undeniable, with Sheehan observing that deferred maintenance "oftentimes doesn't become that front-and-center crisis that folks are dealing with." "So time goes by and facilities age and begin to decompose or pass their useful life," Sheehan said. "And we find ourselves looking back at big dollar amounts where we don't know how we're going to catch up."